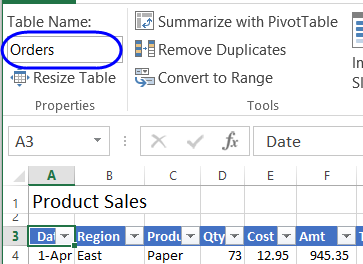 Use Excel's Table command to convert a list of data into a named Excel Table. These tables have useful features, like sorting and filtering, to help organize and view data. 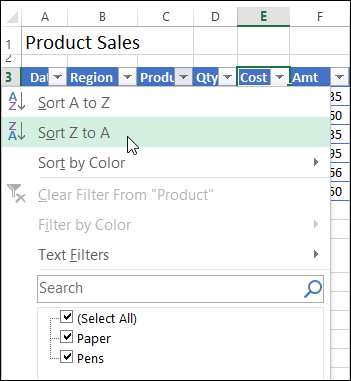 In Excel 2007, and later versions, you can use the Table command to convert a list of data into a formatted Excel Table. Tables have many features, such as sorting and filtering, that will help you organize and view your data. An Excel Table makes an excellent source for a pivot table, so you should use this feature if you plan to create a Pivot Table from the data. Before you create the formatted Excel Table, follow these guidelines for organizing your data. The data should be organized in rows and columns, with each row containing information about one record, such as a sales order, or inventory transaction. In the first row of the list, each column should contain a short, descriptive and unique heading. Each column in the list should contain one type of data, such as dates, currency, or text. Each row in the list should contain the details for one record, such as a sales order. If possible, include a unique identifier for each row, such as an order number. The list should have no blank rows within it, and no completely blank columns. 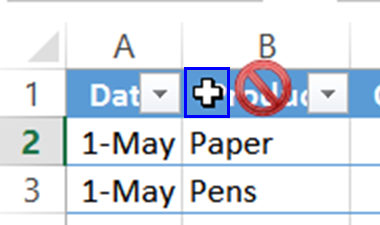 The list should be separated from any other data on the worksheet, with at least one blank row and one blank column between the list and the other data. 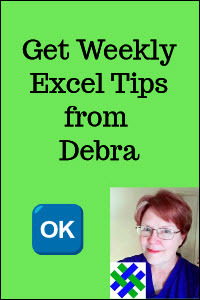 To see the steps in creating an Excel Table, please watch this short video tutorial. The written instructions are below the video. After your data is organized, as described above, you're ready to create the formatted Table. Select a cell in the list of data that you prepared. In the Tables group, click the Table command. 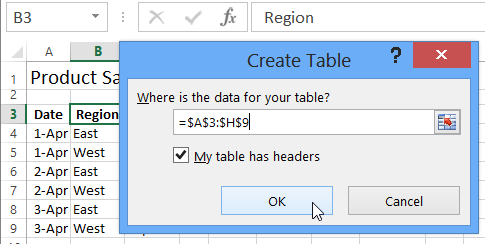 In the Create Table dialog box, the range for your data should automatically appear, and the My table has headers option is checked. If necessary, you can adjust the range, and check box. Your list is now an Excel Table, and is automatically formatted with a default Table Style, which you can change. The heading cells have drop down arrows that you can use to sort or filter the data. 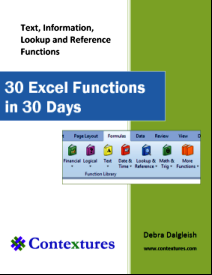 When it is created, an Excel table is given a default name, such as Table 3. You should change the name to something meaningful, so it will be easier to work with the table later. On the Ribbon, under the Table Tools tab, click the Design tab. When you create a table you can apply a specific style from the Table Style options, instead of using the default style. Then, when you are applying that style, click the option to remove any current cell formatting from the data range. When you create a table with the Table command on the Ribbon's Insert tab, the table retains any formatting that it currently has, and the default Table Style is applied. On the Ribbon, click the Home tab. 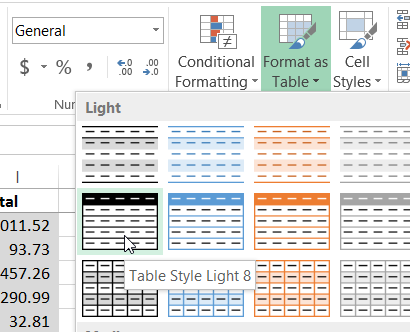 A formatted Excel Table is created, with the selected Table Style. After you create an Excel table, it's easy to show the total for a column, or for multiple columns, using a built-in Table feature. A Total row will be added at the bottom of the table, and one or more column of numbers might show a total. In addition to the automatically created totals, you can select totals for other columns. Click in the Total cell for one of the columns. 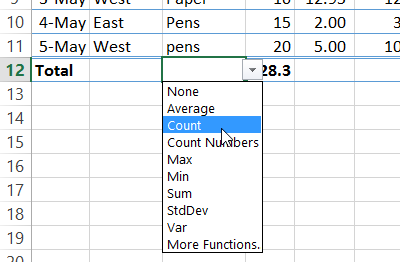 From the drop down list, select the function that you want to use in the current column. 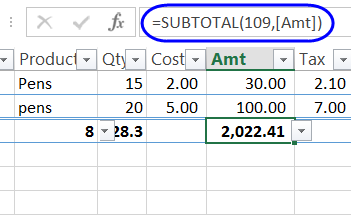 A SUBTOTAL formula is added to the cell, and it shows the calculation based on the visible cells in the table's column. In this example, a formula will be created outside of the table. 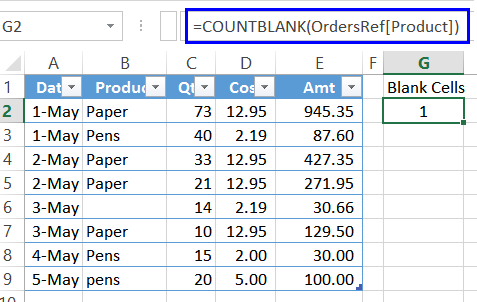 The formula will use the COUNTBLANK function to count the blank cells in a table column. The table is named OrderRef and the column is named Product. Then, click at the very top of the heading cell, for the column that you want to check -- the pointer will change to a down arrow. Don't click on the column button where the column letter is. Then, type a closing bracket, and press Enter, to complete the formula. 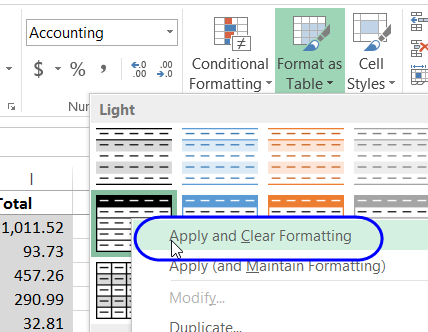 If you plan to use your Excel table as the source data for a pivot table, add a counter field, that can be used in calculated fields, or summary calculations. This is very easy to create and maintain in an Excel table, if you use a simple formula, instead of typing the value. Because the data is in a named Excel table, the formula will automatically fill down to all the rows. It will also be automatically entered when you add new rows. 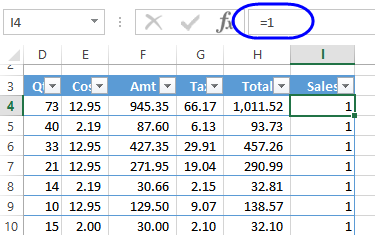 The 1s will give us a value that can be summed in a pivot table, or used in a Calculated Field, to give correct results. 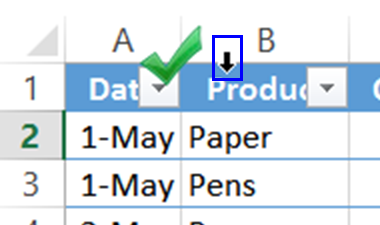 When you are working with lists in Excel, use the built-in Table feature, to make it easier to work with the data. Then, if you want to print just the table, without the other items on the worksheet, you can use a built-in command -- Print List. The command is not on the Ribbon, so you can add it there, or put the command on the Quick Access Toolbar. Watch this short video to see the steps. 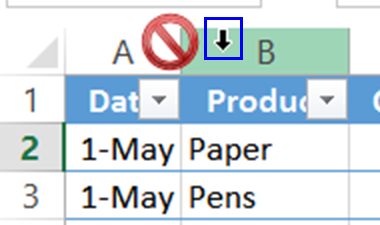 Add new data in the row immediately below a table, or in the column to its immediate right, and the table expands automatically, to include that new data. If Excel tables are not expanding automtically on your computer, you can adjust the settings either manually, or with VBA programming. Watch the video, to see the steps, and read the detailed instructions, below the video. 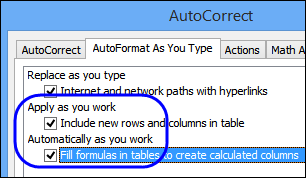 If Excel tables are not expanding automtically on your computer, check the following settings, in the Excel Options window. Now, when you add new data, or create a calculated column, the Excel table should adjust automatically. The following code will list all the named Excel Tables in the active workbook. A new worksheet is inserted, and the table name, sheet name, table address, and source type are listed. To download the sample file for this Table tutorial, click here: Table Sample File. The zipped file is in xlsx format, and does not contain macros.